Everything needed to fly included in ONE box !! 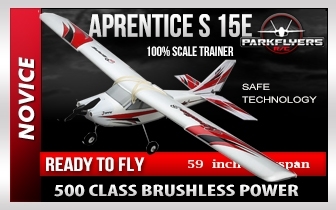 The E-flite® Apprentice® S 15e RTF airplane is the most intelligent RC airplane ever offered by Parkflyers RC. At its heart is groundbreaking SAFE™ (Sensor Assisted Flight Envelope) technology that makes RC flight incredibly easy, even for the least experienced user. Its combination of spatial awareness provides flight envelope protection which adds a degree of security never before available, while its smooth flight capability battles windy conditions so that all you feel is control that’s crisp and responsive. Multiple levels of flight envelope protection are provided that can be reduced or removed as your skills progress, yet the “panic” feature is always there to instantly return the model to level flight if you ever lose orientation. Molded Z-foam construction delivers a lightweight, durable air frame that's also weatherproof and easy to maintain. Compatible with a long list of popular adhesives, it can be quickly repaired at the field if ever necessary. Every electronic component is installed so that you can be ready to fly quickly. The impressive size of The Apprentice S 15e airplane makes it a great choice for large fields such as those maintained by an organized RC club. All you need is a full-range, DSMX compatible airplane transmitter. Assembly takes less time than it does to charge the included Li-Po battery. The carbon-tube supported wing is removable for ease of transportation and straps into place with the included rubbed bands. A quick-release hatch in the belly makes battery installation quick. When your flight skills have progressed, add even more excitement to your RC experience by converting the Apprentice S 15e into a floatplane. The lightweight, Z-foam float set (EFLA550) includes all hardware required plus a steerable water rudder for complete control on the water.